More than one-third of all homicides of women are committed by a current or former partner. Nearly a third of women report having experienced violence at some point in their lives, either physical or sexual, at the hands of a partner. 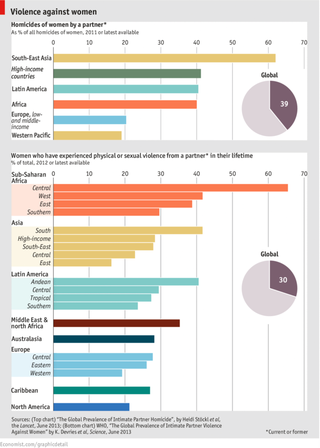 Women are six times more likely than men to be killed by their partner. What is it about "feminist" issues that bring out all of the crazies? Most of the time, comments on the Economist are fairly reasonable, and I'm assuming based on readership demographics they're more well educated and well off, on average. But throw up a graph about violence against women, and suddenly you've got the equivalent of spellchecked Yahoo comments. Did you guys know that this graph was just an attempt on the feminists part to detract from real issues? Did you guys know that in North America, the violence is all women's fault because women are the majority of teachers in public schools, and they should be doing more to teach kids to not be violent? Did you know that it's completely possible to look at a graph showing the data above and still claim that research shows that women are domestic abusers as often as men are? (Note: no one actually referenced the research or studies that they claim to be pulling generalizations from, with the exception of one beautiful commenter who wrote a rebuttal to the MRA type jerks with links to specific studies disproving their claims. I love you, random internet person). And the thing that makes me angriest is that because of these people espousing anti-woman rhetoric and their refusal to admit that there is a problem other than widespread lady agenda, we waste so much time being angry at them, arguing with them, trying to convince them of what has been clearly shown over and over again, that we spend very little time actually trying to fix or work on the problem itself. I'm ashamed of it, but I left the article angrier at the commenters than I was at the statistics themselves, and my focus had completely shifted. In a meta sense, I suppose theoretically that if you can change the attitude of the anti-women crowd, then you've made a huge step towards solving the violence problem, but I hate that it is so indirect, and I feel so impotent. What would it take to convince them?